There appears to be a problem with the temperature sensor at Seattle-Tacoma Airport: it seems to be running several degrees too warm. This is not the first time this has happened. And excessively warm temperatures at airport stations seems to be a growth industry around here. In a previous blog I talked about the problem at Yakima--which has been fixed. Ellensburg is running too warm as well. But this blog will be about Seattle-Tacoma Airport, whose official NWS/FAA temperature sensor is located between two of the runways. Why should you care about this? Because the official records will be wrong and all kinds of records could be broken because of the bad sensor. And since Sea Tac is the most cited temperatures around here, you will think it is a warmer than it really is. 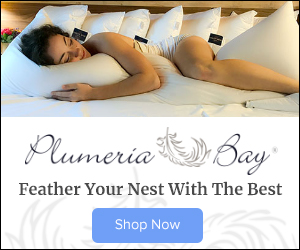 You might even buy an air conditioner. 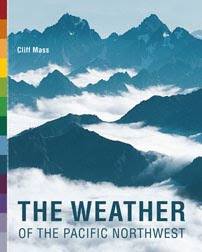 Let me show you why several of us (including Mark Albright, past state climatologist, and Justin Shaw, proprietor of the Seattle Weather Blog).are worried. First, here is a comparison between Sea-Tac's high temperatures and those of a very close station (SEAT6, located 10 blocks away) for days Sea-Tac got to 90F or more this month (see below). 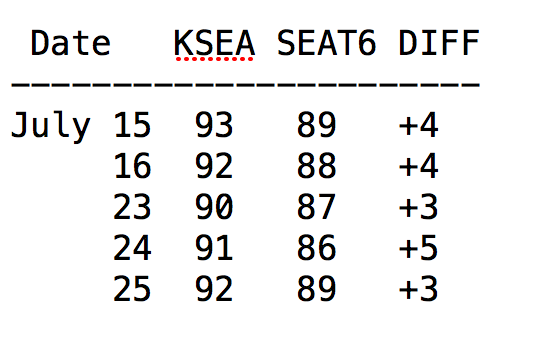 So far this month, Sea Tac got to 90F five times, while SEAT6 did not do it once. 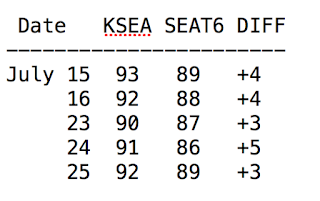 On average, SeaTac is 3-5 F warmer than SEAT6 and other neighborhood stations. A plot of temperatures around Sea Tac at 5 PM this afternoon indicates a problem. Sea Tac's temperature (92F) is a clear outlier. 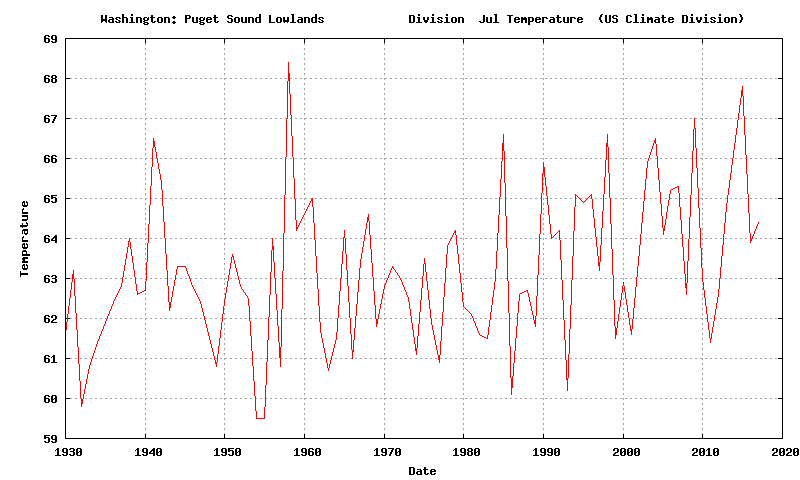 There is another way to show the Sea Tac warming--a longer term comparison to another station. Let's compare Sea Tac against Boeing Field. You would expect Boeing Field to be warmer, since it is in the middle of a more urbanized area, within the Seattle Urban Heat Island, and at lower elevation. 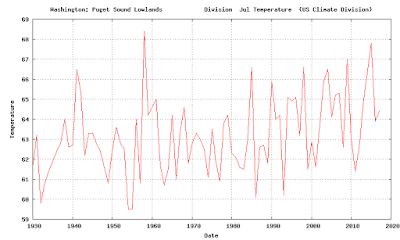 Let's first do the comparison for July 1-25, 2014, after the sensor was replaced following the last warm period. Boeing Field was warmer than SeaTac on most days for the highs and nearly all the time for the lows. This year? Very different. SeaTac generally has higher maximum temps than Boeing Field and the lows are similar...something has changed. I could provide more evidence...but there appears to be a problem, with Sea Tac being too warm...probably a bad temperature sensor. Have you noticed that when there are sensor problems, the result are temperatures being too warm? Often that is due to a broken fan, which is supposed to bring fresh air into the sensor unit. If the fan slows or is broken, the enclosure heats up. Now, an error of several degrees can result in Sea-Tac breaking daily records, or monthly records, or record number of days about 90F, etc. Then the media will headline the records and talk about global warming being the cause. Don't think this scenario is plausible? It happens all the time--let me give you an example. Earlier this year, the Yakima airport temperature sensor failed and provided temperatures roughly 3F too warm...which is a lot. The national media noticed. An AP story by Seth Bornstein and Nicky Forster headlines about 30 years of global warming and cites the Yakima warm anomaly as proof of anthropogenic global warming. But it really was only a bad temperature sensor. Anthropogenic global warming IS warming the planet, but the effects are muted here in the Pacific Northwest. How much have we warmed ? Let's take a look at the mean daily temperature for July for the NOAA/NWS climate division encompassing the Puget Sound lowlands (see below). Around 62.5F before 1980 and warming to around 64 F the last decade (smoothing out the annual ups and downs)-- so about 1.5F over the past 90 years--and a lot of the change occurred between 1975 and 1985. So July's are warming around here. Some of this probably was the result of human-caused global warming, but not all. Of particular interest is the major warming during the late 1970s, when circulation patterns were shifting as the Pacific Decadal Oscillation (PDO) moved into its warm mode (the PDO is a mode of natural variability). Human caused global warming is occurring, but it does not explain periods like this week, when we are 10-15F above normal. The media is already talking about Seattle having the warmest July on record (see below), based on the Sea-Tac Airport temperatures, but is it really? I called a colleague at the Seattle NWS office and he said they will check out the SeaTac temperature sensor. How are these sensors calibrated / compared to national standards? Why aren’t these sensors swapped out every few years? Commercial wind farms do this every 12-24 months so they know how much wind there is and, more importantly to them, how much money they’re making. And why no redundancy? Secondly, why isn’t the data being looked at and analyzed for drift? Again, commercial wind industry does this constantly. It’s not just SeaTac. This is a widely documented problem throughout the US surface station network. Improper sighting, malfunctioning equipment and long term development have all contributed to inaccurate readings. And in turn this data has been used by the media and some unethical academics to sew alarm regarding long term climate. There was a story this morning on KNKX about how this July might be the warmest in history at Seatac. Your article puts that in a new light. DW1735 is my personal station 1.7 miles west of SeaTac and its extremely reliable. My station reached 91 Monday, 90 Tuesday, 91 Wednesday (yesterday). I also tested these temps with my handheld Kestrel thermometer and I had 90 F each day. I would imagine this has always been an issue, not just a recent one. Also, sensors from decades ago probably had no fans. There will always be those who exaggerate for their cause. I think that you are on the mark with global warming - warming is occurring and will likely pose bigger challenges for future generations. Given that the Seattle metropolitan area is dominated by single unit housing shouldn't the most important temperature reading be in such areas. IIRC fire stations once were the location, and would seem more typical than between two runways. If I wanted to know the temperature in my town, I could look at mesowest--hmm, not a single reading in MLT. Well, I see six readings at 9am this morning in the area. I'll just mark them down (from north to south from the I-5/405 interchange down to the north tip of Lake Washington). 76 70 72 73 76 66 72 70--for an average of 72 degrees. I don't even have to figure out the average--if I just throw out the highest and lowests pairs of numbers, I end up with two readings of 72.
a handful of readings around my house and average those out too. Now let's look at Sea-Tac at 9am. I see that it is 72 degrees. Looking at the closest other readings, just going in a circle I see 73, 75, 73, 69 and 69 (and there is a 66 right down near Puget Sound, probably you can throw that one out. Likewise there is an 80 five miles east, throw that out too etc). Now, maybe in the heat of the day something is going on, but at the moment, 72 seems about right. If I was measuring something important, I'd mix up my methods and give it all to a statistics guy to sort out, heh. All houses on these surrounding blocks, so: House, over grass, 4.5 height, solar powered fan aspirated, in white vented housing unit (Davis Vantage Pro 2). Bit of a green belt in the back about 40 feet away, a couple low coverage cement paths about 20-30 feet away. RLL - actually the majority of "official" weather sensors around the country are located at airports. That's because for reasons related to safety, aviators need to know the weather conditions at the terminal, not 5 or 10 miles away from it. Yeah, it’s a bit of a chicken and the egg thing. Prior to airports, weather records were kept at varying locations. And often moved. Portland is a prime example of this with records dating back well into the 1800’s but back then records were kept downtown. Portland is also a prime example of the difference a few miles Alcántara make, especially in the winter with the gorge winds. Interesting topic, but a quick question. How common is it for a temp sensor to run too cold? We all know about sensors artificially heating up due to placement, and being in direct sunlight, or as you mentioned poor ventilation, but what would explain a sensor running too cold af night? Is that a thing? There is a sensor near me, that sits near the Cowlitz river (I live in SW Wa) but on a flood plain at the bottom of a confluence of drainage valleys from the surrounding hills. It has recorded 7 straight nights with lows in the 40’s, including a 38, while most other readings nearby were not nearly that cold (I say “nearby” but they are different elevations and varying distances in miles away). I do know that during the day it does receive direct sunlight and often reads too high for daytime temps. It’s been bugging me this week. It would be good to know if this is the thermometer or just that specific location. Driving through Seattle on 7/23 my car thermometer consistently showed 91F and then while on Ambaum in Burien it climbed to 93F, then dropped again to 90 in West Seattle. This was around 2-3pm with the car in motion. Has anyone asked why these weather stations for NOAA/NWS are not on a scheduled calibration cycle? You would think if we're going to base policy, laws, and climate records off of the data from these stations that we would at the least do a bi-annual calibration on them for accuracy. Have them check the rain gauge while they're at it. I made two comments here in May and June where Seatac reported zero precip while the radar clearly showed significant, extended activity over the KSEA location. I watched it in real time as it came in from the south. In fact *all* of the Seattle area south had measurable precip activity both times - but Seatac reported zero. Great post Cliff. I find it really hard to believe no one is asking the same questions down there. I would imagine if you were a human standing at ground level in the area of the sensor in the midday sun those temps would actually be lower then a person would be experiencing. I'm curious... Is the Boeing Field temperature sensor located in between the runways? It would seem like at SeaTac, with it being surrounded by asphalt and planes landing and taking off, that perhaps that might increase the temperature... But perhaps not. I understand that large airports have historically possessed high tech weather instruments, but always for the simple reason pilots have to know the temperature and wind speed near the runways. Does a taxiing jumbo jet affect this location, or just the acres of concrete? KSEA sensor is at least five miles away from the southernmost tip of Seattle. 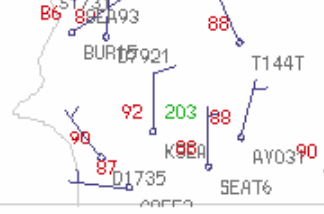 Why does the NWS continue to report the temperature along a taxiway between two runways as the "Seattle" temperature? Could we use the NWS Sand Point location instead? A lot cooler, but at least it is in Seattle. I was a weather instrument nerd in my youth. I had an actual NWS standard "cotton region type" instrument shelter (aka stevenson screen) (still have it at my folks house). Back in the analog days people had to actually go out and read the thermometers. Imagine that! I still have a set of NWS surplus Weksler min and max thermometers. In fact, in the official NWS manual for taking readings, it says if the temp of the minimum thermometer disagreed with the temp of the maximum one by more than 1 degree, you were supposed to report it. Ah the irony of old-school analog tech being more reliable than our modern digital stuff. Anyway, maybe it's time to bring back the old school instrument shelter with mercury thermometer, if nothing else to check it every so often against the "official" digital one. This is a major problem across the country, and seriously needs to addressed. Between the location and uptick in jet travel, not a single heat record can be considered real. The National Weather Service sent out a technician to check out the weather station at the airport after UW Professor and weather blogger Cliff Mass speculated the station was reading temperatures hotter than it should. Tests showed the thermometer was actually recording temperatures between .6 and .82 degrees cooler than it should. NWS Meteorologist Mike McFarland said that's within the tolerances the Weather Services requires of its weather stations so Thursday's high of 92 is official and correct along with the rest of this week's 90-degree readings. I think drew has an excellent idea. A digital meter of this type should have at least some redundancy. Then using analog gauges to tadle on the expensive stuff sounds great! Interesting. I am puzzled why the NWS didn't check the fan. I would think a fan failure would have caused a larger temperature spike. Is the sensor an RTD? If so they have two failure modes, one with an increase in temperature reading due to a manufacturing flaw or a complete shut down. You would think the calibration would have found either one. Does it bother anyone else that the National Weather Service is running a marketing campaign on this July weather? Check out the NWS twitter feed (which I had no idea even existed) and/or #wawx. After not making 5 consecutive days of 90 degrees today, they quickly shifted to number of days >= 88. You can't make this up. Nothing about this smells right. None of it. Shhhhh! You are getting in the way of a Progressive Lie For The Cause! By the way, why does it routinely take 10 or more "Captcha" screens to post a comment? A reminder this morning that areas with microclimates amplify the challenges of acurate forecasting. As i type this, between Edmonds and Lynnwood, it's pouring, and there was even hail for a minute or two. The culprit, of course, is a PSCZ. When I left this morning - I'm often out in the early a.m. with my camera - I noticed the mid-level instability in the cloud deck and brought raingear. I've seen our local microclimates make a mockery of the forecast too many times to be fooled - even in the middle of the summer. The rain wasn't forecast, or even hinted at, in the forecasts until it was happening. Perhaps we should call these "hindcasts," since that's what they are. And perhaps at times it's simply impossible to predict the weather in the heart of the convergence zone. Anyway, it definitely illustrates why the idea of an "official " airport temperature is often misleading and/or irrelevant in this part of the world. Got any evidence to back that up? Is the same conspiracy occurring globally, accounting for global increases too? How do they manage to fool the satellite temperature readings? How do they manage to fool the Arctic sea ice into melting? BFI has one large runway and one much shorter general aviation runway. I understand why airports have weather stations. My question is why are airports, which does not meet the weather bureau own minimum siting rules, official weather stations? Huge heat island effect, infrastructure changes, aircraft exhaust. LA California has an official weather station on the top of a parking structure, another city also in California has it official weather station on the roof of a fire house. Studies have show than liberals/progressives take more airplane flights each year, and fly more miles each year, than thsoe who consider themselves conservative. Seattle is 80% "liberal" and sure enough, SeaTac has been setting records the past few years in number of passengers. The more affluent one is, statistically, the greater one's carbon footprint, making affluent Democrats the largest per-person causes of Climate Change in the USA. If they alone, and nobody else, changed their habits, climate change could be significantly impacted. They don't want to talk about that, though. They want to talk about how the "others" are killing the planet. You know, the others. The people who's main post-high school choices are between the military and the local Walmart. Those without good progressive educations. The people who grow our food, slaughter our T-bone steaks, catch our fish, protect our country (and corporate profits), and drive our packages from the NYC camera store to our homes. Oh, they are just so ... not us. We don't know anyone who voted like the "others". And they are the cause of climate change in our minds. Their non-belief in manmade climate change is what causes climate change! And we will not rest until each and every one of them is a believer! We don't give a rip about our own culpability, and we will hang at high noon via the noose of social media anyone who dare cast a shred of blame in our direction. Cause it's not about the climate, silly, it's about the affluent liberal dog whistle that is climate change. You know, the one that says "I'm with the ruling class, not with the Walmart class, and my mom and dad had the money to send me to a good school!" I mean, did you really think we cared about the climatic comfort of the breeder's great grand-children? We walk past homeless people every day while taking our previous num nums to doggie daycare, and we don't break stride. The wellbeing of humans we don't know, 100 years from now, hasn't ever crossed our mind. But they're so MAD at the oil companies! So, so mad! I mean, sure, the oil companies only exist to fuel the jets that fly them to Europe, Asia, and beyoind. Sure, the oil companies exist to pump gasoline into the affluent Seattleite's car. But it's the oil companies that are denying climate change, and someone else is making those companies rich ... not us! Our cars run on ... well, no one ever brings it up when we're hanging out with like-minded people, so we've never had to justify it. It's a perk of progressive membership. Blind eyes to hypocricy are part of the "progressive" social contract. We're just blowing the dog whistle, so you know without a shred of doubt, that we're on the side with the power and perks. Good Luck getting NWS to correct this sensor. Back in the 1990s you could go to any weather station and look up the siting. Time and again we found problems with the siting and the NWS's answer was to close this information to the public. Good Luck!